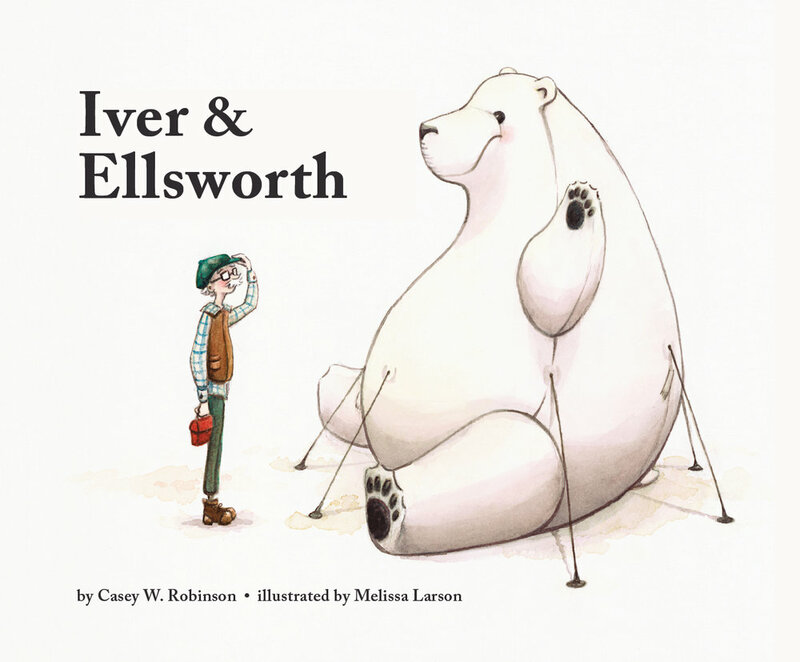 Listen to author Casey W. Robinson and publisher Rob Broder talk about Iver & Ellsworth on The Children’s Book Podcast. Casey W. Robinson grew up in Maine and now lives with her family in Massachusetts. She occasionally drives past a rooftop bear in the nearby city of Worcester. She writes stories for children, but they aren’t always about children. Iver & Ellsworth is her first picture book. Visit her website: CaseyWRobinson.com. Melissa Larson attended Azusa Pacific University for a BFA in art and a minor in writing. Right now she is likely off to a new somewhere (she can’t sit on the same rooftop very long). She prefers peanut butter and jelly on her whole wheat. This is her first picture book. Visit her website: MelissaLeannLarson.com. This gentle story about friendship, devotion, and commitment features an unlikely pair: an elderly man and an inanimate (or is it? ), inarticulate inflatable polar bear that adorns the rooftop of the factory where the man works. Every day, white, gray-haired Iver takes his lunch on the roof, where he sits with this bear, dubbed Ellsworth. Iver takes it upon himself to care for Ellsworth, clearing away dead leaves, snow, or rain streaks, depending on the season, and making sure his ropes are fastened. One day, Iver is very slow going about his business, and he tells Ellsworth he is about to retire. The following spread is an exemplar of restraint with few words (" ‘I'm going to miss you,' he says"); this is succeeded by a few spreads with no words, showing only in pictures the characters' stories in parallel: Iver eating alone in a diner and going to the movies by himself; Ellsworth loosed from his rooftop ropes, blowing across the city. The happy ending resolves neatly when Ellsworth lands—where else?—on the roof of Iver's home. Larson's pencil-and-watercolor illustrations fit the tone, portraying a riverside industrial city with rolling hills beyond in suitably subtle grays, browns, and greens. Bare trees, a white background to the images, and the muted colors suggest this takes place in winter; companionship in the winter of life is a cozy theme, portrayed comfortingly here. From a factory rooftop, Iver and his good friend Ellsworth (a rooftop bear) are content to watch the busy world below. "Everyone's going somewhere," Iver says. "We can see the whole world from up here. That's enough somewhere for me." But after Iver retires, the friends must venture out in search of a new somewhere. Of course, the very best views are those you share with an old pal. Imaginatively written by Casey W. Robinson and charmingly illustrated with the artistry of Melissa Larson, "Iver and Ellsworth" is an original and unfailingly entertaining picture book that will prove of very special interest for children ages 5 to 7, as well as an enduringly popular addition to family, preschool, elementary school, and community library collections.